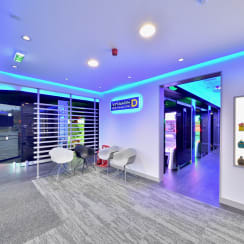 The subjects comprise a modern and extensive single storey purpose built retail pod fitted out in the corporate style of Indigo Sun. The subject property is located in East Kilbride, Scotland’s sixth largest town with a population of over 80,000. East Kilbride is located approximately 12 miles south east of Glasgow’s City Centre and benefits from excellent road connections to Scotland’s Motorway Network. The property comprises an extremely prominent and accessible retail pod situated to the north east side of Kingsway and south of Lees Burn Court. Kingsgate Retail Park which extends to approximately 213,000 sq ft and is anchored by a Sainsbury’s supermarket. Other retailers within the Kingsgate Retail Park include Currys, TK Maxx and Homebase. There is a new B&Q warehouse located directly opposite. The subjects are surrounded by a number of national operators which include Domino’s, McDonald’s, Frankie & Benny’s and Burger King.